At Opus 1 Music Studio we offer several group class options for beginners that help you align the age and music interests for your budding musician. Our classes are taught by expert teachers who offer the highest standard of education for your child. Scroll below to see an overview of our group classes. Dates, times, and locations vary. Not sure what class is right for you? We're here to help! You can chat directly on our website, email us at info@musicopus1.com or call us at either of our locations. This weekly class for adult beginners uses a structured curriculum and materials that will develop your talent and ability. Your class instructor will guide your learning to include finding notes on the keyboard, reading notes in the music, understanding rhythm, and beats, as well as music theory. Together with fellow adult students, you’ll learn several different styles of music such as classical, jazz, pop music and more within a fun and supportive atmosphere. Pieces will include both solo and group music. Introducing our NEW Adult Guitar Class for beginners! Inspired by popular demand, we've designed the class with flexibility for busy professionals while still providing a structured curriculum. Our ongoing “drop-in” model lets you navigate around meetings, work trips, and family time while learning to play music you enjoy. Each class provides music fundamentals such as note-reading, rhythms, and technique while introducing concepts such as chord patterns, song play-along, and introduction to various music styles. My First Guitar Group Class (MFG) is a beginner guitar class for students with no experience. The class will cover basic technical aspects of guitar playing: posture, hand position, strumming, and picking. Students will play through music learning simple chords to put to songs, rhythm, and sing along with your guitar. In addition to performance, students will learn about different forms and styles of music through listening exercises. The goal of the class is to develop an appreciation for the guitar through this introduction class. Music is a universal language. It transcends boundaries and reaches beyond culture to touch the depths of our souls, express our common emotions, and inspire us all. 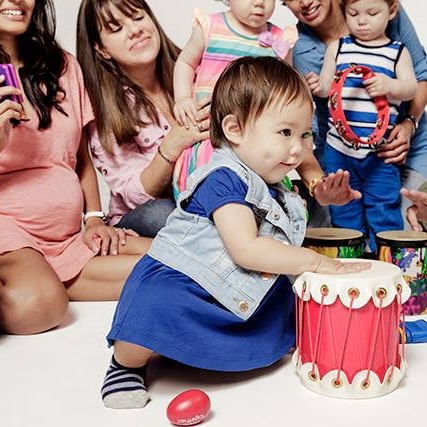 In our Music Together class, each child participates at his or her own developmental level in singing, moving, chanting, listening, observing, or exploring musical instruments. We welcome the whole family to join in this important family music experience, and any caregiver—parents, grandparents, nanny—can bring the child(ren) to class. What better addition to summer than a fun music camp! Our summer music camp offers both our Music for Little Mozarts and Music Discovery classes. Week-long sessions (Monday-Friday) are available in June, July, and August. Our Music Discovery class has morning, afternoon, and all-day sessions led by our fun and experienced Opus 1 teachers. Students will learn about different instruments, rhythm, and musical concepts through varying activities that help to bring out the best qualities and interests of every student. Click below to learn more! Our MYC Sunshine class is a keyboard program for ages 3-4 and the starting point of the MYC® Method, building their foundation in music reading and playing the piano. Students experience movement through beats and rhythms, as well as developing their fine motor skills with rhythm instrument ensemble playing. Children start learning the geography of the piano and note-reading through our MYC Critters (and their stories that children can relate to). By the end of the Sunshine program (after 36 weeks), children are able to play their first scale (C Major) and are reading from the staff. Once a child has finished Sunshine, they are ready to move onto Sunbeam. Still not sure which class is right for you? Contact us!